Updated daily at 12:02 hrs ST except for the CBI which is updated every 15 minutes after the initial midday reading. 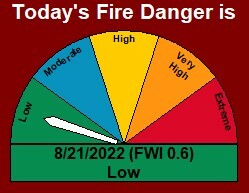 The Fire Weather Index (FWI) is based on weather readings taken at noon standard time and rates fire danger at the mid afternoon peak from 2:00 – 4:00 pm. The Grass Fire Danger Code (GFD) is based on predicted generated "fire intensity (kw/m²)" in grass type vegetation (dry grass, tussock). This code denotes how difficult it would be to control a fire in this vegetation type should one start. The Forest Fire Danger Code (GFFDC) is based on predicted generated "fire intensity (kw/m²)" in grass type vegetation (dry grass, tussock). This code denotes how difficult it would be to control a fire in this vegetation type should one start. Last updated @ 4/21/2019 12:02:06 PM Central Time By FWI Calc (Ver 10.4.1.107).